MailChimp provide powerful marketing & email automation tools to reach more customers and grow businesses. With MailChimp for Linnworks, you can import customer names and email addresses from Linnworks into your MailChimp mailing list automatically as your orders are processed. Millions of businesses around the world rely on MailChimp's powerful marketing automation tools to reach more customers and increase their business. MailChimp for Linnworks is designed to enhance your list generation by automatically importing the email addresses and customer names from your Linnworks orders to your contacts in MailChimp, ensuring you have an up to date mailing list every time you start a new campaign. 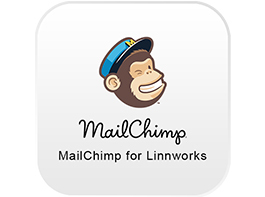 MailChimp for Linnworks is embedded into Linnworks, and developed and supported by eBusiness Guru. MailChimp for Linnworks exports data on processed orders from Linnworks (source, subsource, customer name & email address) and exports it to a MailChimp group. c)	Click on Application Store option (Screen1) it will open applications list page. e)	Click on Install, to add Mailchimp app. In the left menu, click on Apps. Enter username and password and click the Log In button. On successful login, the home screen will open. Here users can set the flag for starting system to download Linnworks process orders. Click Yes to start the system download. Here users can purchase credits to send data to MailChimp. Users can purchase credits using Paypal or Stripe payment gateway. User has to select credits from dropdown and according to selection system will display the amount to be paid. Tick the box next to the terms and conditions, then click Pay Now. The system will add credits when the payment has completed. Click on Credit & Debit Card Checkout button, it will display the page below (Screen16). Complete the required fieldds, then click Pay Now. The system will add credits into the user's account on successful payment. Here users can complete the required information, then click on Stripe Payment. The system will add credits into user account on successful payment. As per the page above, MailChimp for Linnworks will display a summary of how many orders data (Source/ Sub source, customer name, email) has been sent to MailChimp. (as highlighted with a red square on the screen above). Click on the number to display the page below. (Screen20) MailChimp for Linnworks will display the status of each orders data - whether it has been updated in the MailChimp account or not. If updated then it will display MailChimp updated, with the date and time. 1. How far back can I backdate contact/email address imports? 2. Can this application perform any other features apart from extracting customer names and email addresses from Linnworks processed orders and importing them into my mailing list? Not at the moment. We hope to add more features/functionality soon, but should you have suggestions for features you would like to see, please let us know.